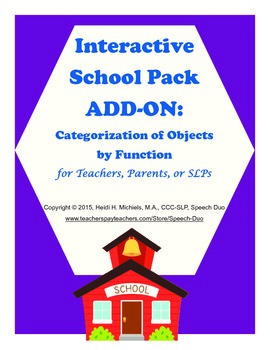 In addition to the concepts addressed in the Interactive School Pack found in our TpT store, this download addresses the crucial skill of categorization. 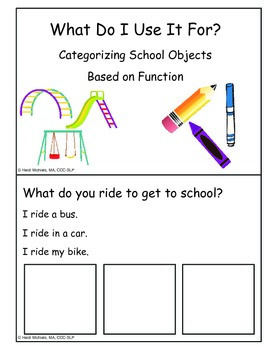 Using school-related items, students will be asked to categorize them based on their functions. 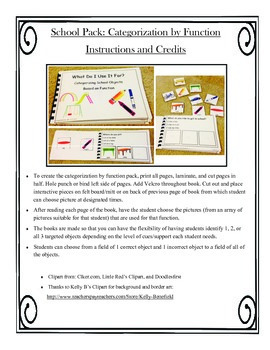 After reading each page, students can chose the items that are used for that function. This book is made so that you have the flexibility of having students identify 1, 2, or all 3 targeted objects depending on the level of cues/support each student needs. Students can choose from a field of 1 correct object and 1 incorrect object to a field of all of the objects.